L. 1. AN Act for reforming of deceitful dyeing of Silk. L. 1. An Act against Deceits used in Weights, Beams, and Scales. L. 1. An Act concerning Brokers. Mr. Alford, - against the Bill, for the Matter and Manner. - That Mr. Jernegan hath passed so many, as not fit to trouble the House with them. - Moveth, Wednesdays and Saturdays only for private Bills. Committed to Sir James Scudamore, Sir Wm. Cooke, the Knights and Burgesses of Gloucestershyre, and Knights of Suffolk, Sir Herbert Croftes, Mr. Tho. 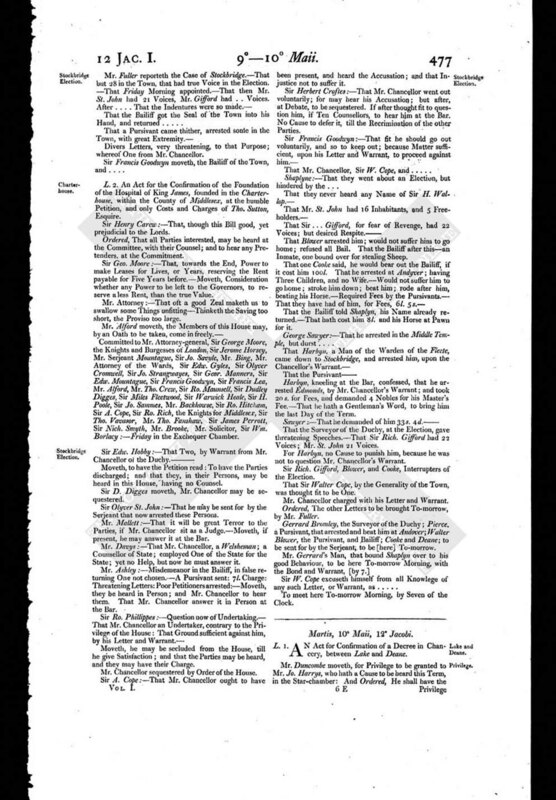 Crew, Sir H. Poole, Mr. Hackwill, Sir Mawrice Berkeley, Sir Olyver Cromwell, Mr. Hoskyns, Sir Nevill Poole, Sir Carey Reynolds, Mr. Francis Moore : - Wednesday next, Exchequer. Sir Edwyn Sands moveth, the Sub-committee for the Conference, may presently withdraw themselves into the Committee Chamber. Mr. Fuller reporteth the Case of Stockbridge. - That but 28 in the Town, that had true Voice in the Election. - That Friday Morning appointed. - That then Mr. St. John had 21 Voices, Mr. Gifford had . . Voices. Divers Letters, very threatening, to that Purpose; whereof One from Mr. Chancellor. L. 2. 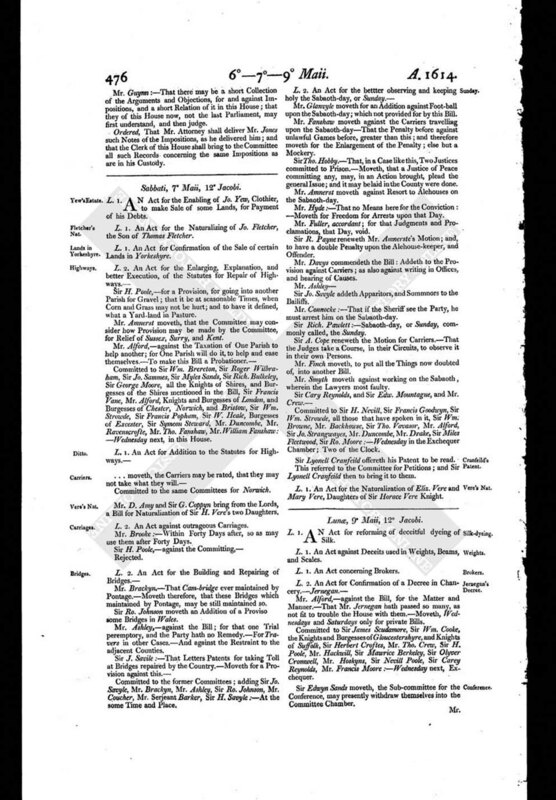 An Act for the Confirmation of the Foundation of the Hospital of King James, founded in the Charterhouse, within the County of Middlesex, at the humble Petition, and only Costs and Charges of Tho. Sutton, Esquire. Sir Henry Carew: - That, though this Bill good, yet prejudicial to the Lords. Ordered, That all Parties interested, may be heard at the Committee, with their Counsel; and to hear any Pretenders, at the Commitment. Sir Geo. Moore .- - That, towards the End, Power to make Leases for Lives, or Years, reserving the Rent payable for Five Years before. - Moveth, Consideration whether any Power to be left to the Governors, to reserve a less Rent, than the true Value. Mr. Attorney : - That oft a good Zeal rnaketh us to swallow some Things unfitting - Thinketh the Saving too short, the Proviso too large. Committed to Mr. Attorney-general, Sir George Moore, the Knights and Burgesses of London, Sir Jerome Horsey, Mr. Serjeant Mountague, Sir Jo. Savyle, Mr. Bing, Mr. Attorney of the Wards, Sir Edw. Gyles, Sir Olyver Cromwell, Sir Jo. Strangwayes, Sir Geor. Manners, Sir Edw. Mountague, Sir Francis Goodwyn, Sir Francis Lea, Mr. Alford, Mr. Tho. Crew, Sir Ro. Maunsell, Sir Dudley Digges, Sir Miles Fleetwood, Sir Warwick Heale, Sir H. Poole, Sir Jo. Sammes, Mr. Backhowse, Sir Ro. Hitcham, Sir A. Cope, Sir Ro. Rich, the Knights for Middlesex, Sir Tho. Vavasor, Mr. Tho. Fanshaw, Sir James Perrott, Sir Nich. Smyth, Mr. Brooke, Mr. Solicitor, Sir Wm. Borlacy : - Friday in the Exchequer Chamber. Moveth, to have the Petition read : To have the Parties discharged; and that they, in their Persons, may be heard in this House, having no Counsel. Sir D. Digges moveth, Mr. Chancellor may be sequestered. Sir Olyver St. John: - That he may be sent for by the Serjeant that now arrested these Persons. Mr. Mallett . - That it will be great Terror to the Parties, if Mr. Chancellor sit as a Judge. - Moveth, if present, he may answer it at the Bar. Mr. Davys: - That Mr. Chancellor, a Welshman; a Counsellor of State; employed One of the State for the State; yet no Help, but now he must answer it. Mr. Ashley : - Misdemeanor in the Bailiff, in false returning One not chosen. - A Pursivant sent: 7 l. Charge: Threatening Letters: Poor Petitioners arrested: - Moveth, they be heard in Person; and Mr. Chancellor to hear them. That Mr. Chancellor answer it in Person at the Bar. Moveth, he may be secluded from the House, till he give Satisfaction ; and that the Parties may be heard, and they may have their Charge. Mr. Chancellor sequestered by Order of the House. and that Injustice not to suffer it. Sir Herbert Croftes: - That Mr. Chancellor went out voluntarily; for may hear his Accusation; but after, at Debate, to be sequestered. If after thought fit to question him, if Ten Counsellors, to hear him at the Bar. No Cause to defer it, till the Recrimination of the other Parties. Shaplyne: - That they went about an Election, but hindered by the ..
That Blower arrested him; would not suffer him to go home; refused all Bail. That the Bailiff after this - an Inmate, one bound over for stealing Sheep. That the Bailiff told Shaplyn, his Name already returned. - That hath cost him 8 l. and his Horse at Pawn for it. Harbyn, kneeling at the Bar, confessed, that he arrested Edmonds, by Mr. Chancellor's Warrant; and took 20 s. for Fees, and demanded 4 Nobles for his Master's Fee. - That he hath a Gentleman's Word, to bring him the last Day of the Term. That the Surveyor of the Duchy, at the Election, gave threatening Speeches. - That Sir Rich. Gifford had 22 Voices; Mr. St. John 21 Voices. For Harbyn, no Cause to punish him, because he was not to question Mr. Chancellor's Warrant. Sir Rich. Gifford, Blower, and Cooke, Interrupters of the Election. That Sir Walter Cope, by the Generality of the Town, was thought fit to be One. Mr. Chancellor charged with his Letter and Warrant. Ordered, The other Letters to be brought To-morrow, by Mr. Fuller. Gerrard Bromley, the Surveyor of the Duchy; Pierce, a Pursivant, that arrested and beat him at Andover; Walter Blower, the Pursivant, and Bailiff; Cooke and Deane; to be sent for by the Serjeant, to be [here] To-morrow. To meet here To-morrow Morning, by Seven of the Clock.